This is designed for use with your AED. Saving someone's life is serious business; this is why our kits contain field-proven tools to help you prep your patient for the application of the AED as well as CPR. It also provides you with protection from contaminants during a rescue. 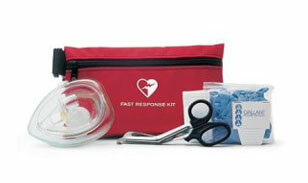 Kit includes small case, scissors, gloves, alcohol swab/wipe, and a CPR pocket mask.